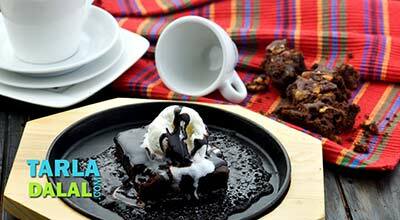 This recipe is a great combination of brownies, custard, chocolate sauce and strawberries. . 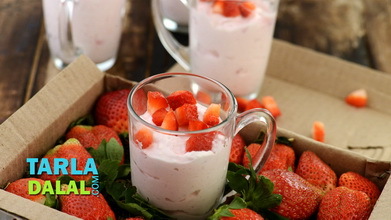 Combine the custard powder and ¼ cup of cold milk in a small bowl and mix well till the mixture is smooth and no lumps remain. 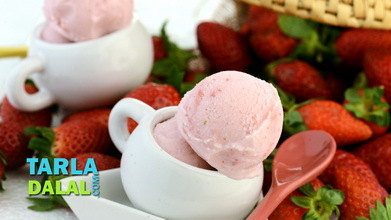 Combine the remaining 1¾ cups of milk and sugar in a broad pan, mix well and bring to boil. Add the custard-milk mixture, mix well and cook on a medium flame for 2 to 3 minutes, while stirring continuously. Remove from the microwave, mix gently and keep aside to cool slightly. 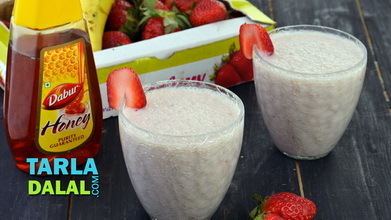 To make the syrup combine the sugar and ¼ cup of water in a small bowl and mix well till the sugar dissolves completely. 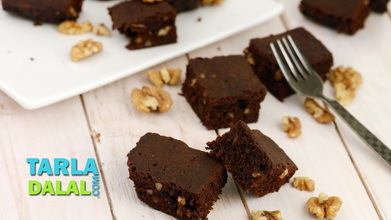 Place 4 brownie pieces on a plate and pour 1½ tbsp of the prepared sugar syrup on each brownie. 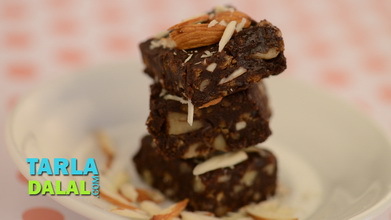 Keep aside for 10 minutes so the brownie pieces soak the sugar syrup well. Combine the prepared chocolate sauce with ¼ cup of milk, mix well and keep aside. Combine the prepared custard with beaten whipped cream and vanilla essence, fold gently and keep aside. 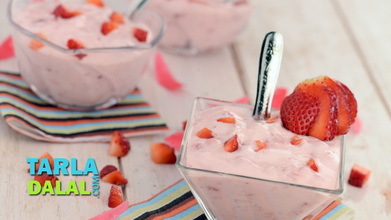 Place 2 brownie pieces in a serving glass, put 3 to 4 strawberry slices and top it with ¼ cup of custard. Again put 3 to 4 strawberry slices and top with 2 tbsp chocolate of sauce followed by 3 to 4 strawberry slices, 2 tbsp of custard and 1 tbsp of chocolate sauce. Finally sprinkle 1 tbsp of mixed nuts over it and top it with a strawberry slice. Repeat the steps 5 and 6 to make 1 more glass. 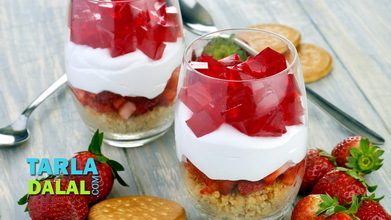 Refrigerate for atleast 1 hour and serve chilled.